I painted this on location at the Chicago Botanic Gardens. When I got there I was a little disappointed because the day was overcast, but I started painting anyway. 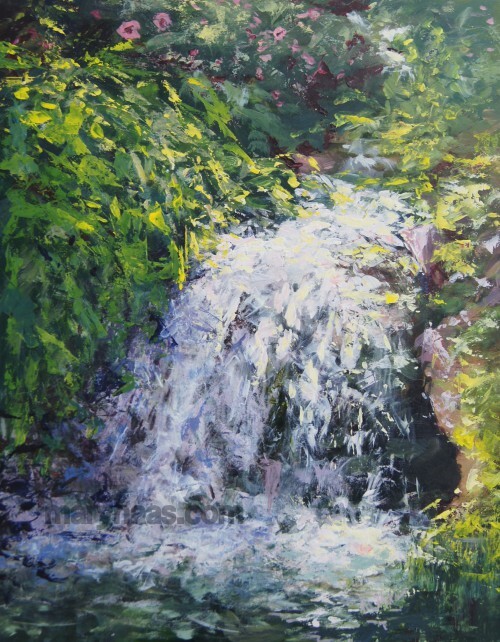 It was absolutely wonderful when the sun broke through the clouds right as I was finishing up, and I was able to add in the effect of the light on the falling water. Waterfall at the Chicago Botanic Gardens. 14×11, acrylic on gessoboard. This piece is currently for sale. Prints are available at Fine Art America. I love the movement in this. The water is full of life. Also how descriptive it is with the brushstrokes.